On Valentine’s Day, with the Eternal City providing a stunning backdrop, you can surprise that special someone with an unforgettable dinner by culinary genius Heinz Beck at La Pergola; enjoy a soothing couple’s massage at the Cavalieri Grand Spa; dine in a symphony of taste created by Chef Fabio Boschero at L’Uliveto restaurant or watch fireworks from the roof garden with champagne and dessert. 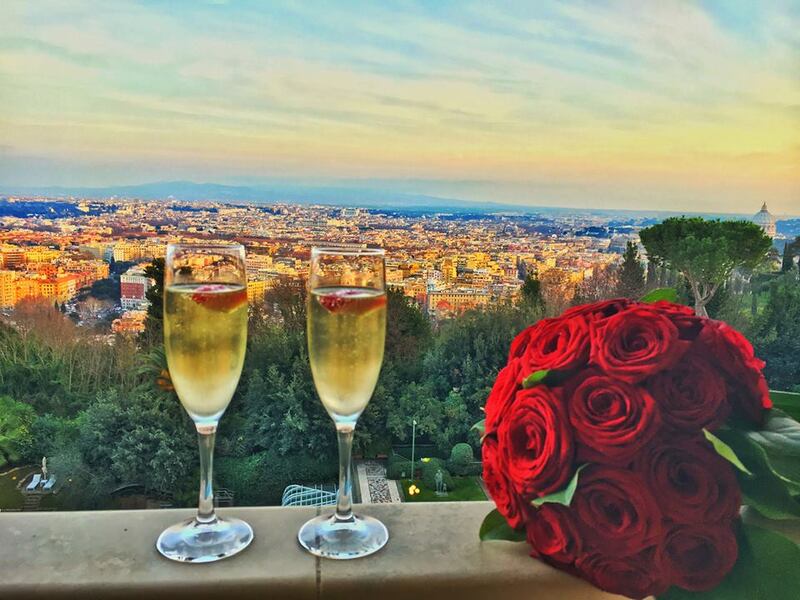 Signature cocktails, culinary masterpieces, live music and the Colours of Love on this Valentine’s Day at the Rome Cavalieri. Here Valentine’s Day Events Program. A luxurious retreat for the whole family. Discover how to entertain the kids and pamper your pooch while you treat yourself to some Spa time or a jaunt downtown for some shopping on Via Condotti. Click Here. The most beautiful models in the world are now available at the Rome Cavalieri for those hankering after the fast lane. Name your dream design and the car will roll up the drive, ready for you to take it on a spin around town and country. The scenery is stupendous, golfers can combine sightseeing with views of St Peter’s Basilica from the fairways. This is Rome golf at its finest. The Rome Cavalieri is home to one of the greatest private art collections in the world with over a thousand treasures ranging from 16th Century masters to contemporary art; from Nureyev’s ballet costumes to Gallé glass. The Executive Chef Francesco Apreda with his culinary culture and his passion, marks the step in an unmistakable way, giving each dish a fascinating culinary journey between tradition, technique and desire to surprise. So, for Valentine’s dinner he thought of a menu that manages to excite: “Mixed Flavors”. Here the menu. Bringing together Fabio Ciervo’s innovative italian cuisine with barman’s creative cocktails, Hotel Eden invite you to discover a new kind of dining experience. 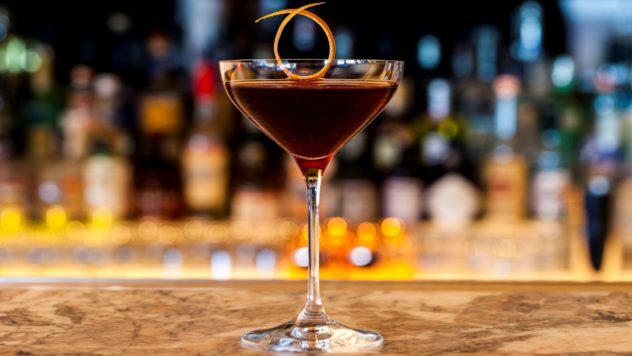 Over five courses you’ll enjoy signature dishes such as crispy red mullet with seaweed tartare, each paired with mini handcrafted cocktails to beautifully complement the flavours and ingredients. Here Five-course tasting menu with mini cocktail pairings. From Wednesday, February 20 to Monday, March 18. From September 5 (every Wednesday and Friday, 7 – 11pm) “Dj Nights” will start again. As the sun sets, the whole of Rome sparkles into life. Admire the breathtaking view over an aperitivo at Il Giardino Bar, sipping the Bar Manager Gabriele Rizzi’s signature drink La Grande Bellezza with Rose vermouth, tamarind, mandarin, Los Siete Misterios mezcal or The Green Lady with Tanqueray gin, fresh basil, Eden citrus, egg white, celery bitters. The rose is said to be the flower of love, so we’re delighted to present our luxurious MEI ritual inspired by the evocative fragrance of this precious bloom. The ritual begins in our couple’s suite with a 50-minute massage with wild Persian rose essence, before a 25-minute Sonya Dakar facial with Rose Gold Radiance Mask to brighten the complexion. To finish, we invite you to Il Giardino Bar to try our signature cocktail, ‘Kiss from a Rose’, with treats from executive chef Fabio Ciervo. 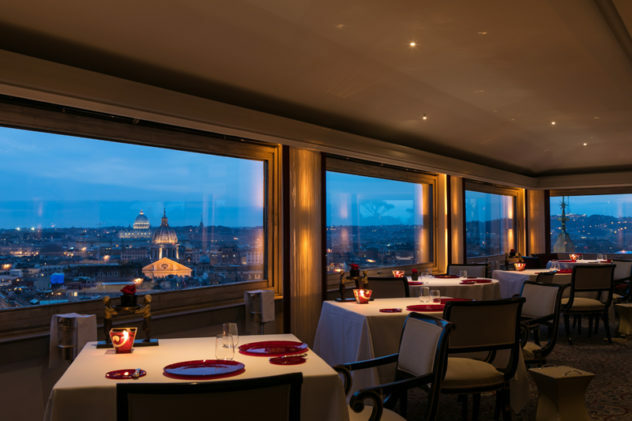 The St. Regis Rome inaugurates the new year completely renovated. 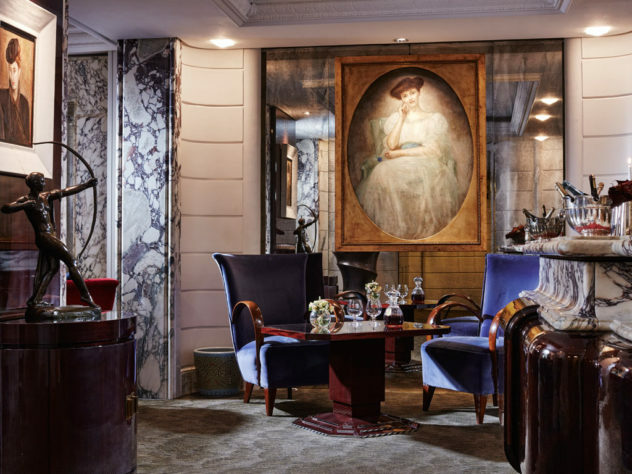 The restyling, curated by the interior design studio Pierre-Yves Rochon Inc., pays homage to 125 years of history celebrating the evocative light of Rome and reinterpreting in a contemporary key the timeless elegance of the hotel. 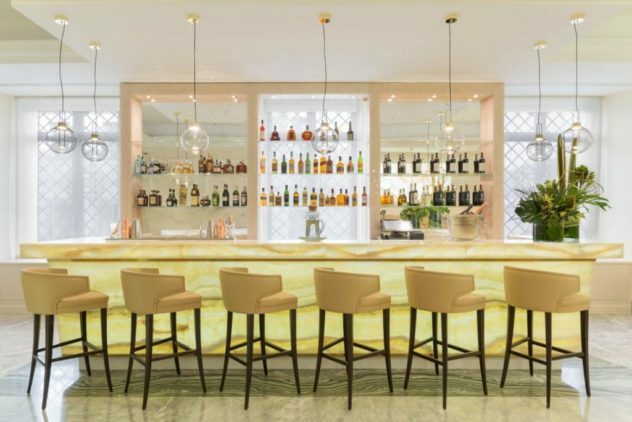 All the public areas, such as the Lobby, the Lounge Bar and the Library and all the hotel’s 23 luxurious rooms and suites have been completely renovated. Each stay is made unique by the discreet, continuous and dedicated attention provided by the St. Regis Butler Service. 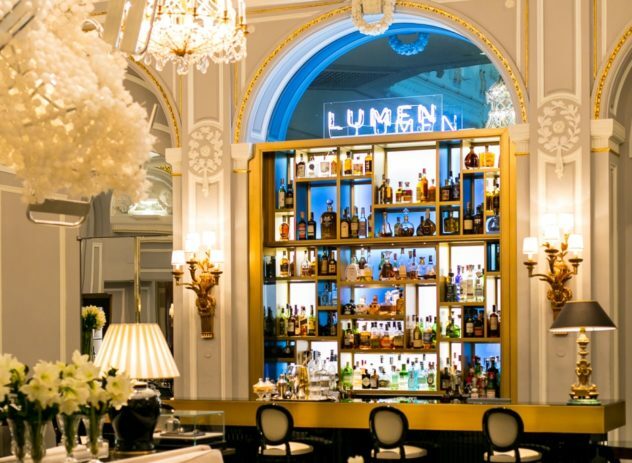 It’s the place of choice for lunch, dinner, a snack and original evening cocktails. An elegant counter in shades of gold and black is framed by a backlit blue glass bottles display, with an important collection of wines & spirits from all over the world. The Lounge Bar is directly connected to the innermost sapphire blue Library, which covers an accurate collection of books. Ideal for conversing in culture and art during the “Afternoon Tea Ritual”, a glass of wine or the “Sabering Ritual”, the Library embodies the essence of the modern glamor of the St. Regis brand, with its empire-style crystal chandeliers, the Venetian mirror decorated and the black marble fireplace. The St. Regis Rome has signed a collaboration with the international art gallery “Galleria Continua” to introduce its guests to masterpieces of the best exponents of the contemporary art scene. The hotel will host a series of exhibitions every six months. The calendar has been inaugurated by Loris Cecchini, protagonist with the installation of four works located in the common areas of the hotel, so that they can be enjoyed and appreciated by all hotel guests. On show until March 3rd. Discovering secret and ancient Rome with two exclusive itineraries in collaboration with “IF Art Unique Experiences”. The first is “The Evolution of a District”, an amazing journey through time to discover the extraordinary events that have transformed the area where the Baths of Diocletian, the largest spa complex in the world, were located. The second path, “Exploring Rome under a New Light”, shows the historical center of Rome from a new point of view, through four extraordinary places usually inaccessible, linked to each other by the theme of light: the Renaissance chapel inside the Church of the Santi XII Apostoli, the private bathroom of Palazzo Doria Pamphilj, the Casanatense Library and the church of San Luigi dei Francesi, where you’ll can admire the famous Contarelli triptych by Caravaggio in total tranquility. Mirrored walls, octagonal tables and precious stones are just a few of the details found in the Art Déco style restaurant, Sapori of Lord Byron. To dine at Sapori is about far more than the meal itself, it is an unforgettable dining experience. Guests will be a part of an authentic familial atmosphere typical of sophisticated Roman circles but all the while seated at an exclusive, refined restaurant. Sapori’s unique Art Déco design carries guests into a glamorous bygone era. Here Valentine’s Day menu. The Sunday Brunch has developed into a Roman tradition. Let Chef Oriana Tirabassi surprise you with her interpretation of a classic Festive Sunday Brunch. From 12.30pm to 3.30pm at the Sky Blu restaurant. Restyling for the AcquaRoof terrace which, thanks to the new roof, can be experienced even in the coldest months and at all hours, from morning to breakfast until late night for an after dinner. New proposal contains several souls: kitchen, cafè and cocktail bar. Three aspects mixed together to offer guests a transversal taste experience, in a welcoming and comfortable atmosphere that can be summed up in the “Sea Lounge” description. AcquaRoof Terrazza Molinari reconfirms a simple and essential kitchen, mainly by the sea. Spontaneous and refined, cuisine it is shaped by the character of the Chef Angelo Troiani (1 Michelin Star), assisted by Chef Claudia Ceppaluni; that stands out for its original format: le Gocce, small distilled taste to taste à la carte or within specific tasting routes; small gastronomic delights that arise from the encounter between Italian cuisine, the Roman culinary tradition and that of the Mediterranean. 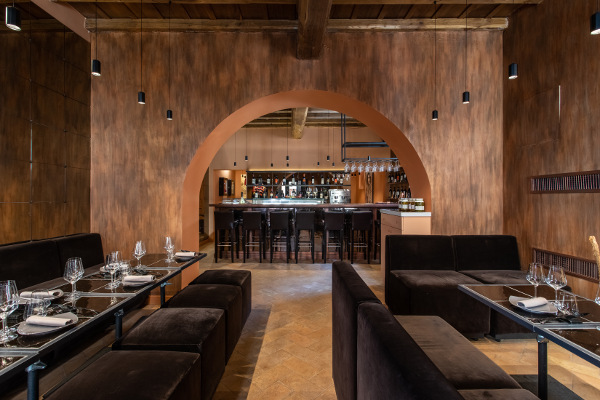 The hotel’s new restaurant “Il Ferro e il Fuoco” is inspired by Renaissance atmospheres. The idea that led the project was to give life to a place that would transmit the history of the convent, while using modern furniture; warm colors have been chosen, such as gold and smoky gray, which fill the spaces without weighing them down. The result is an intimate and cared space in every detail: even the mise en place is carefully studied to remember a historical table, with modern elements designed by Mario Luca Giusti, well-known artist who works with synthetic crystal. Chef Emidio Gennaro Ferro (hence the name of the restaurant) offers a menu also inspired by the era of the Renaissance. The gastronomic journey has been imagined and realized together with a historian who, with his advice, has allowed to elaborate refined dishes and modern combinations, even with typical dishes of the time. The popular Parisian-russian brand chooses Rome for its debut in Italy and opens on the fifth and sixth floors of Palazzo Rhinoceros, in a unique space created by the architect Jean Nouvel. 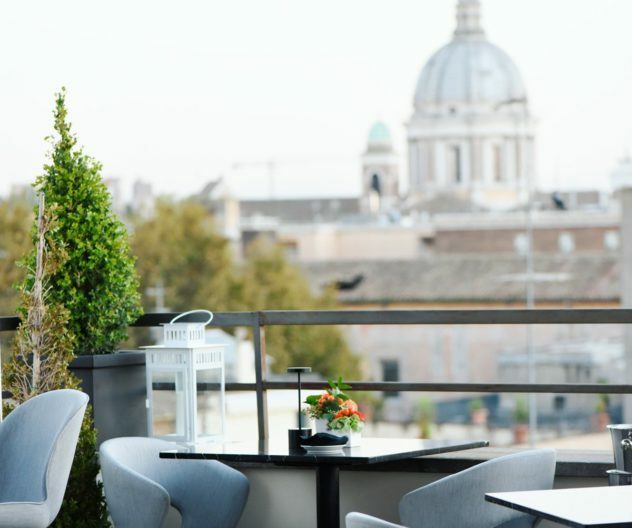 With an exceptional 360 ° view on the Imperial Rome, with three panoramic terraces and a versatile food and wine proposal, the restaurant is a candidate to become a point of reference in the city, from breakfast to dinner. Breakfast, lunch, snacks, dinner and cocktails await you with in a menu that ranges from caviar to international dishes, always with a careful look at the Italian gastronomic tradition. 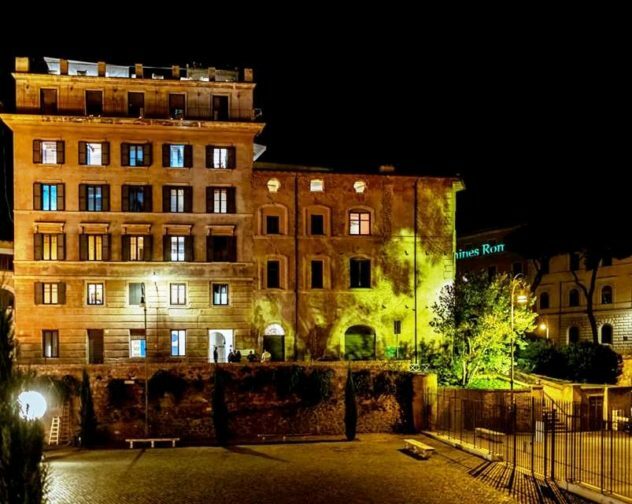 Caviar Kaspia Rome is connected both to the exhibition spaces of the Fondazione Alda Fendi-Esperimenti and to “The Rooms of Rome Palazzo Rhinoceros”: 24 apartments where architecture and culture live beyond traditional boundaries and hospitality is combined with art. Clic Here for Christmas and New Year’s Eve menus. New space dedicated to culinary proposals next to the Trevi Fountain. 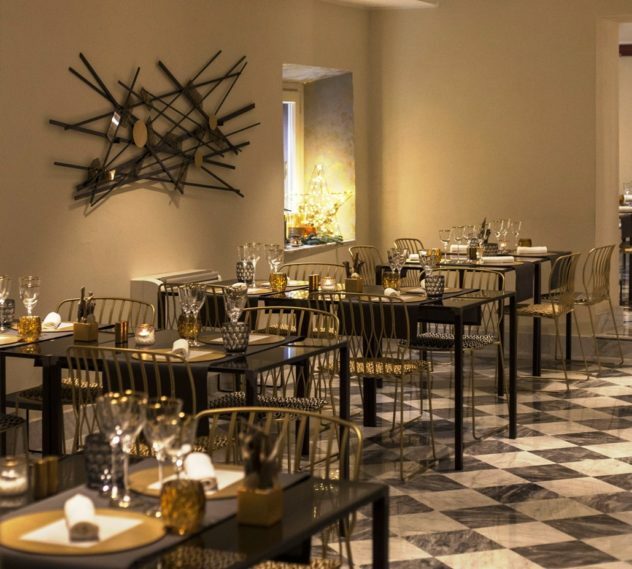 Il Vicolo is a place of experimentation: the gastronomic tour designed by a chef and the culinary journey among the beauties of Rome are just some of the experiences proposed. The protagonists at the Vicolo are the producers, who alternate in a path of presentations, seasonal food and wine tastings and ad hoc dinners.